The New Wave of Campus Protest: What's Behind the Oxy Occupation? Students around the country are in revolt. So the pundits are pontificating. Much of it is hogwash, but there have been a few thoughtful analyses of what's happening on American campuses. One of the best is a column in Sunday's New York Times, "Why Are Student Protesters So Fearful?" by Todd Gitlin, a sociology professor at Columbia University, a one-time president of Students for a Democratic Society (SDS) in the 1960s, and the author of outstanding books about that rebellious decade (The Sixties: Years of Hope, Days of Rage), the anti-Vietnam war movement (The Whole World is Watching), Occupy Wall Street (Occupy Nation), community organizing (Uptown), and other movements. Much of what Gitlin says about the current student protests on campuses around the country is insightful. His analysis of students' wariness about their futures, as the nation and the world faces economic and environmental turmoil, rings true. Public opinion polls show that Americans under 25 -- and college students in particular -- are not happy with the political and economic status quo, widening inequality, global warming, and attacks on immigrants and women's right to choose. A significant number question the viability of capitalism and are willing to consider some version of socialism. These attitudes account for young people's enthusiasm for Bernie Sanders' presidential campaign. In recent years, college students around the country have been mobilizing around a variety of issues. They've pushed their institutions to divest from energy corporations that are destroying the environment, demanded that colleges stop doing business with companies that make their clothing in global sweatshops, insisted that colleges address the problem of sexual assaults on campus, successfully pressured many state governments to allow undocumented immigrant students to pay in-state tuition at public universities, and rallied behind campus workers fighting for a living wage. The current wave of protests -- primarily around issues of racial inequality -- is both a part of that broader movement and also something different. The killing of Michael Brown last year by a police officer in Ferguson, Missouri, and the ongoing clashes between black communities and local police forces, led to the emergence of the Black Lives Matter movement. That set the stage for the recent student protest at the University of Missouri (an hour from Ferguson), which led to the ouster of the university president and a spate of new programs and initiatives to address Black students' demands for a more inclusive campus. The protest at Mizzou, in turn, inspired students at many other colleges and universities to express their solidarity and to demand reforms at their own institutions. Many college students -- especially first-generation students and students of color -- arrive on college campuses expecting a tolerant and welcoming atmosphere. When they confront the reality that college campuses aren't immune to racism, stereotypes, and bigotry -- among fellow students, faculty, and staff alike -- they respond with shock, anger, frustration, and/or a sense of alienation ("Do I belong here?"). Minority students face a daily diet of "micro-aggressions" that go beyond interpersonal insensitivity and bad feelings. They are also matters of institutional practices. They are stopped by campus police who don't think they are students. They deal with professors who question whether they really wrote that first-rate paper. They are told that they are lucky to be at a top-notch college (as though they are charity cases). White students (and even professors) often ask them what "Black people" think about a particular topic, as if each Black student represents the entire race. They even have to deal with being called the "N word" by fellow students. 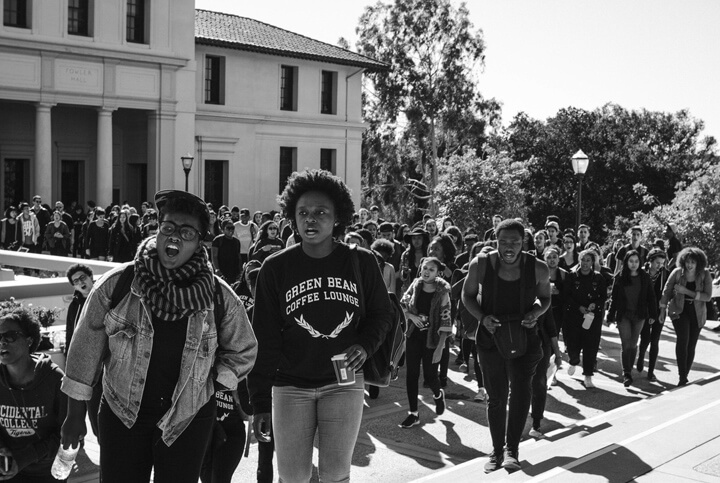 These experiences can make minority students feel isolated on a predominantly white campus. Students also face structural inequities that can't be addressed simply by raising the awareness of fellow students and professors about class and racial privilege. When low-income students go to the same classes and live in the same dorms with affluent students who drive expensive cars and spend more on beer money than they have for books and supplies, and when they have to work 20 hours a week to pay for college expenses and help their parents pay they rent, they realize that despite how hard they've worked to get to prestigious college (or college in general), the playing field isn't level. That propels most of them to work even harder, but it is also profoundly dispiriting. Although many low-income, and even middle-class, students get significant levels of financial aid, most of them know that they will graduate with a huge burden of debt, and enter a job market in which the incomes of college graduates are stagnating. The rising cost of college, the erosion of the value of federal Pell grants, and the shaky job market aren't matters that can be solved by each college acting on its own. These are questions of national policy and priorities. This is why the recent calls by politicians like Elizabeth Warren and Bernie Sanders to reduce the cost of higher education resonate so well with today's students and recent graduates. In light of all these experiences and burdens, it is not surprising that, as Gitlin observed in his Times column, some student protesters may feel somewhat vulnerable. Vulnerable, perhaps, but hardly cowed or intimidated. They don't feel like helpless victims. They believe they can be responsible agents of social change -- on campus and in the larger society. Students in general, students of color in particular, and Black students even more so, are rightfully angry and upset about many aspects of our society in general and their colleges and universities in particular. The 400 students who occupied Occidental College's administration building for five days last week, and who won almost all of their demands, quickly turned their "hot" anger into "cold" anger -- phrases used by the renowned community organizer Ernesto Cortes. They gained considerable confidence as their protest gained more and more support among fellow students. I was particularly impressed with how the Latino, Asian, and white students rallied as allies with the Black students who led the protest. What do they want? The Oxy (as the college is known) students demanded the creation of a long-delayed Black studies program (to parallel existing Asian studies and Latino studies programs), more faculty of color, more funding for student of color organizations (comparable to what other student groups receive), programs to educate faculty, staff, and students about cultural diversity, a vice president responsible for monitoring and initiating diversity programs, changes in the practices of the campus police force, and a first-year seminar program that focuses on writing and other skills but also gives faculty in a variety of science, humanities, and social science disciplines an opportunity to discuss social justice matters. Logistically, the protest rallies, the discussions about problems and solutions, and the occupation were incredibly well-organized. The protest leaders were constantly reassessing their strategy in light of new information. There was constant communication among the students. 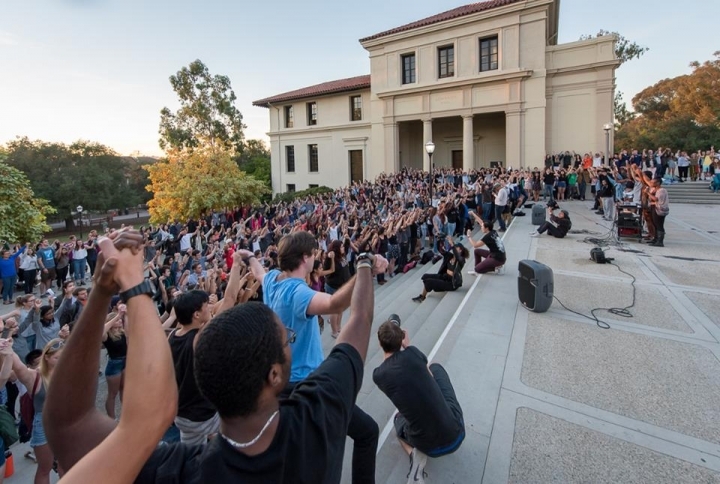 They quickly set up a Facebook page, Oxy United for Black Liberation and a website to communicate with each other, the broader student body, Oxy alums, and the college administration. Students asked professors to hold their classes in or near the administration building and many did so. They invited speakers from Black Lives Matter and United Farm Workers union icon Dolores Huerta to talk with them. 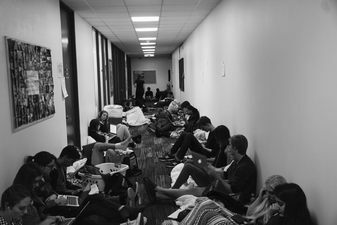 Many students did their homework while occupying the building; they were very self-aware about getting sleep, eating healthy, and making sure that students who felt sick went to the health center. When the occupation was over, the students cleaned up the administration building in order not to make more work for the college cleaning staff. In his New York Times column, Gitlin worried that the current student protesters have tried to shut out the mainstream media because they don't trust it. At Oxy, that wasn't quite true. Yes, the student protesters were skeptical about the media, and for good reason, since much of the reporting (including the Los Angeles Times) trivialized their concerns. In reaction to that, the students had a pretty sophisticated desire to "control the narrative," as they put it. Despite their wariness, they did speak to reporters but they designated certain students as their official spokespersons. Any protest movement is filled with theatrics. The media likes the drama and the personalities. But the stakeholders have to follow the advice of the old civil rights song: "Keep your eye on the prize." They have to focus on the issues. For its part, the college administration made it clear that it would not seek to arrest the occupiers and would respect their freedom of expression. After some fumbles and misteps, it gradually responded to the protesters' concerns that reflected a desire to find common ground, although often with language that some students found patronizing. President Jonathan Veitch acknowledged their frustrations and noted that he had learned a great deal about students' feelings and experiences as a result of the protest. Except for the students' call for him to resign, Veitch agreed to their demands - some with specific timetables and others with a willingness to figure out a gameplan. In the 1980s and 1990s, Oxy was in the forefront of addressing diversity issues in terms of recruiting minority faculty and students and revising the curriculum to incorporate race-oriented topics in the humanities, sciences, and social sciences. Barack Obama, who attended Oxy in the mid-1980s, had his first experience as an activist as part of the college anti-apartheid movement -- although it failed to get the trustees to divest from companies doing business in South Africa. In 1988, when the trustees hired scientist John Brooks Slaughter as Oxy's president (he served for 11 years), he was the first African American to head a highly-ranked predominantly white liberal arts college. Oxy devotes a significant amount of funds to provide financial aid for low-income and even middle-income students. In fact, given its modest endowment (about $400 million), Oxy has a higher proportion of low-income students (represented by the number of students with federal Pell Grants) than all but two of the top 50 liberal arts colleges, as ranked by US News. The number of minority students at Oxy has increased gradually in recent years, but this isn't true for Black students. Oxy does reasonably well in terms of the graduation rates of students overall and students of color, but there is still much room for improvement. Many other colleges have now equaled or even surpassed Oxy on a variety of diversity measures. But because of Oxy's history and reputation as an inclusive institution -- aided by its identification with Obama -- students arrive with high expectations. The current student activists have heard many times that Oxy has often been on the cutting edge of diversity issues. But when they experience racial and ethnic bigotry -- overt or subtle -- they aren't comforted by statistics or testaments to Oxy's oft-repeated mission of "excellence and equity." The current student protest reflects their concern that even if Oxy compares well in some respects with other institutions, it isn't sufficient. This is felt most deeply by students of color but I've been impressed by how many white students -- wealthy, middle class and low income; male and female; gay and straight; activists and bystanders -- share these concerns. Most students, regardless of their backgrounds, want Oxy to be the college that it claims to be in its marketing brochures and website. In many ways it is -- small classes, an emphasis on community service, faculty members with a passion for teaching, a wide variety of student organizations, lots of campus events featuring outstanding speakers and artists, many opportunities to study abroad and conduct independent research, and a beautiful campus. But on some matters -- like last year's clash over sexual assault, the recent controversy over the mishandled firing of a popular campus cop, the growing number of part-time faculty with no prospects for tenure, and the administration's slow response to student and faculty pleas to hire a chief diversity officer -- the college has stumbled. Veitch arrived at Oxy (from the New School University in New York) in 2009 after the college had been through a decade of turmoil. Following Slaughter's departure in 1999, Oxy had two regular and two interim presidents in ten years. Veitch saw his job as restoring the confidence of alumni and potential funders, as well as faculty, in Oxy as a highly-ranked liberal arts college. For years the trustees had mismanaged the college's endowment, so when Veitch came to Oxy, it had fallen further behind its peer institutions in endowment-per-student. Veitch had to quickly raise money for capital projects, student scholarships, and additional faculty. In the past few years, he says, the college has set records for fundraising -- modest by Pomona or Amherst standards, but better than before. Maintaining and strengthening Oxy's reputation as a diversity pioneer was on his agenda, but he failed to persuade many faculty and students that it was a top priority. Now it is, thanks to the student protests. Oxy can become a better institution as a result of these recent events. Most faculty members want to see the kinds of changes the students asked for. Many alums agree. It would also be a good idea to invite a few younger alums (in their 30s and 40s) to serve on the board of trustees -- people who can relate to current students and their experiences. The student protesters understand that the victories they've just won are not the end. They are stepping-stones to further reforms to change both the practices and the culture of the institution. "The occupation is over but the movement has just begun" they said, as they ended the five-day occupation on Friday. Indeed, the changes that the protesters set in motion will have long-term consequences for the students who arrive long after they graduated. My only real concern is whether students -- at Oxy and elsewhere -- can "seal the deal." Students today are so skeptical of people in power (including college administrators) that they sometimes can't take "yes" for an answer. In the worlds of community, union, and civil rights organizing, the goal of protests, confrontations, civil disobedience, boycotts, and strikes is to pressure opponents to negotiate a binding written agreement -- or in some cases a change in the law. That requires that the movement delegate a small group of folks to constitute a "negotiating team" to work out the details, costs and timetable; report back to the larger group what they've accomplished; and to monitor the agreement over time to make sure that people in authority do what they promised to do. It doesn't mean that they've been co-opted or that there's no need for further change. It means that they've consolidated their victories, given students a sense of their own power, and changed the relations of power between the administration and students. They should celebrate their victories, while acknowledging that more needs to be done. The Civil Rights Movement recognized that while getting President Lyndon Johnson and Congress to pass the 1964 Civil Right Act, the 1965 Voting Rights Act, and the 1968 Fair Housing Act were incredible victories, and made life considerably better for African Americans, these laws did not end racism. There was (and is) still much more work to do. As the great civil rights organizer Ella Baker said, "We who believe in freedom cannot rest."